On 26th November 1981, "Euro Princess" (Montreal to Odessa with corn)grounded on Sable Island, Nova Scotia, Canada during a Force 11 storm. The lifeboats and rafts were smashed by the waves. "Euro Princess" fired distress rockets which were seen by the PSV "Balder Hudson" which was safety boat for the jack-up rig "Rowan Juneau". "Balder Hudson" transmitted "Mayday Relay" and closed to assist. 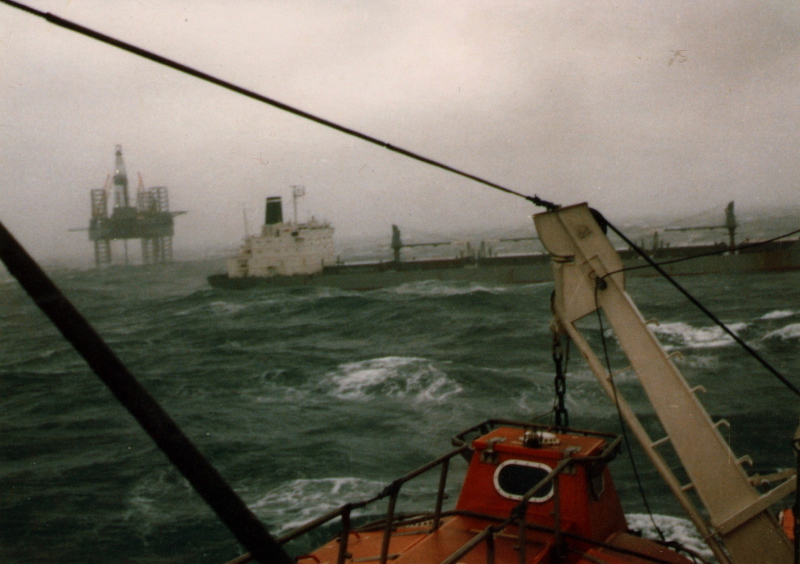 As it did so, "Euro Princess" broke free from the sand bar, and began drifting, powerless, and with her back broken, towards the rig, which was drilling on a high-pressure gas well. "Balder Hudson" closed with the drifting "Euro Princess" and fired a rocket-line with a towrope attached. The rocket-line was being hauled aboard "Euro Princess" when "Balder Hudson"s propellers cut it. "Euro Princess" drifted past the rig at a distance of 200 metres, and was able to drop anchor. "Balder Hudson" made numerous attempts to rescue the crew of "Euro Princess", but desisted when RCAF helicopters approached. All 26 crew were winched to safety. "Euro Princess" was towed to Halifax under Lloyd's Open Form, and re-delivered to Owners. The crew of "Balder Hudson" were awarded the Canadian Minister of Transport's Commendation for Bravery. Great! Very good Description.Thank you. This photo has been shown 1,628 times since it was added to the site.